Lots of things that come from the garden are magical, but First Prize for magic goes to the little pumpkins. This year’s crop is in, with a total haul of 90 pounds. The friend who first gave me these seeds called it “the Kraken vine.” That’s because the vine is enormous and will keep growing until the first frost stops it. This year’s Kraken vine succumbed to the frost on Oct. 21. 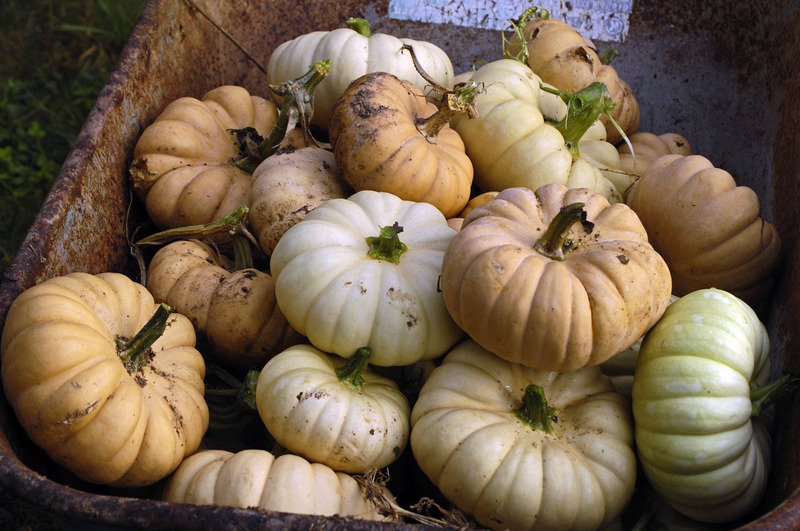 It’s best to leave all the little pumpkins on the vine until frost, then harvest them all at once. The crop started with only three hills, three seeds each. By harvest time, the vines were 35 feet long. The vines had jumped the garden fence in two places and were working their way across the yard. 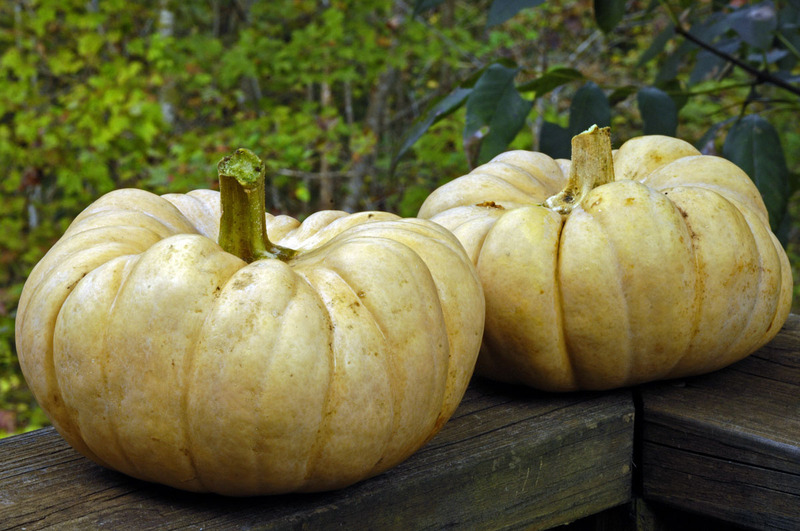 Though I call them “little pumpkins,” if you buy the seeds from Baker Creek Heirloom Seeds, they are called “Long Island Cheese Pumpkins.” I assume that’s because they resemble a wheel of cheese — and they’re just as heavy as a wheel of cheese. 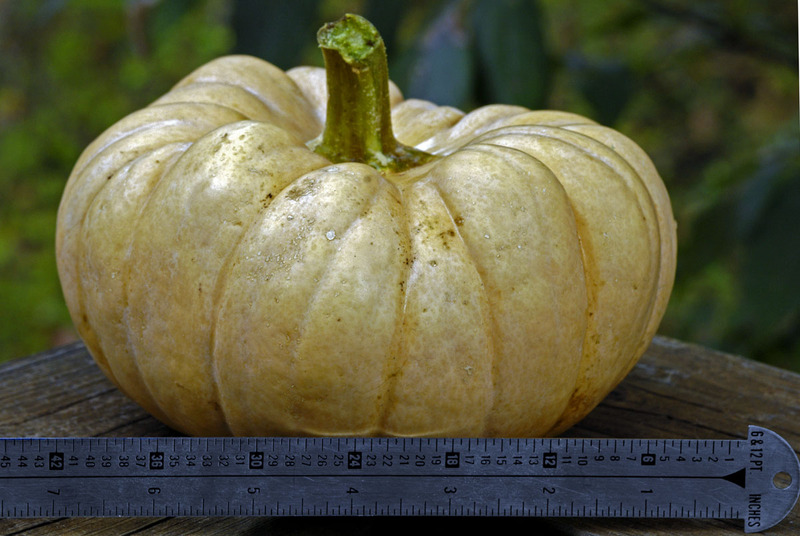 The 6.5-inch pumpkin in the photo below weighed 3.3 pounds. My pumpkins are smallish and rarely exceed 8 inches in diameter. Check out the rave reviews for these pumpkins at Baker Creek. The Baker Creek variety seems to be a slightly larger variety than my variety, which came from a friend. 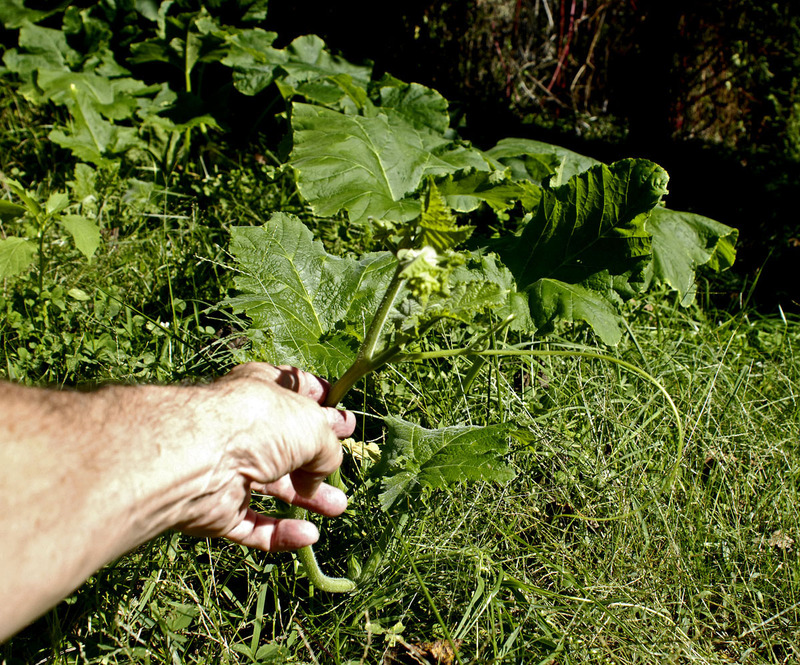 He acquired the seeds from a community seed bank. Another remarkable thing about these pumpkins is that they will keep forever. I still have one left from last year’s crop! I plan to wash the new crop and store them under the stairs. They make an incredible winter food for storage. This 6.5-inch pumpkin weighs 3.3 pounds. The wheelbarrow was so heavy that I could hardly push it. The Kraken vine, after it jumped the fence into the yard and headed for the house. This was written by daltoni. Posted on Tuesday, October 23, 2018, at 9:37 am. Filed under Food. Bookmark the permalink. Follow comments here with the RSS feed. Trackbacks are closed, but you can post a comment. Such a prolific crop of pumpkins. I predict good pumpkin dishes coming from the Abbey kitchen all winter and beyond. My favorite fall item is acorn squash. Oh, I recognize this one — pumpkinus harry pottimus. Because someone we both know is suffering from anemia, I’ve been reading a lot about the connection between diet and anemia. By sheer coincidence, PUMPKINS came up as a way to help cleanse the spleen. Along with squash and carrots. Think fall colors, and eat them.